Any visit to Melvern with a camera deserves a stop at Melvern Railroad Park, where an overlook allows photographers a vantage point for photographing trains with the Atchison, Topeka & Santa Fe Pratt Truss Bridge. 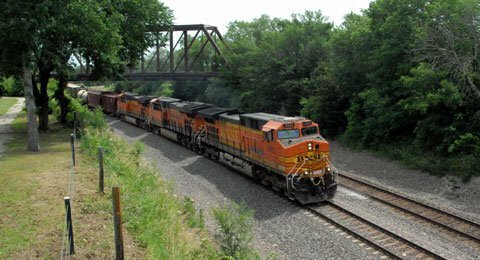 Rarely is there a long wait for a train to travel along the tracks at the south edge of Melvern, as two branches of the BNSF Railroad come together here. According to the city of Melvern’s website, http://www.melvernks.com/, the A.T.&S.F. Pratt Truss Bridge was built in 1909 to carry vehicular traffic over the hand dug cut. It is one of the few left in the United States that spans an existing railroad line. Numerous photo and railroad buffs travel to Melvern to take the opportunity to view and photograph trains. The park area is under development to showcase the bridge, which was placed on National Register of Historic Places in 2003. Some of Melvern’s other features near Railroad Park are a large community garden, a bark park with obstacle course, and a skate park. In recent years, development of Riverfront Park and Trails, an extensive trails system along the Marais des Cygnes River, has made the town a popular place to visit for hiking and mountain biking.